Rite of Passage III. 1980. 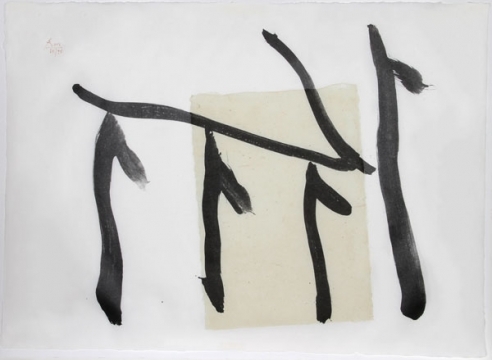 Lithograph with chine colle on white Mulberry hand-made paper, signed and numbered in ink. 24.5" x 34"
Robert Motherwell (American, 1915-1991) emerged as one of the most influential painters from the abstract expressionist generation of the 1950s and 1960s. He was the youngest of the New York School (a term conceived by Motherwell himself), along with Philip Guston, Willem de Kooning, Jackson Pollock and Mark Rothko. Deeply influenced by surrealism, philosophy, modernism and the writings of Edgar Allen Poe, James Joyce, and Octavio Paz, Motherwell created a distinct abstract style featuring saturated hues, bold colors and expressive brushstrokes. He has had solo exhibitions at major institutions worldwide, including the Royal Academy of London, MoMA and Peggy Guggenheim’s Art of this Century Gallery.